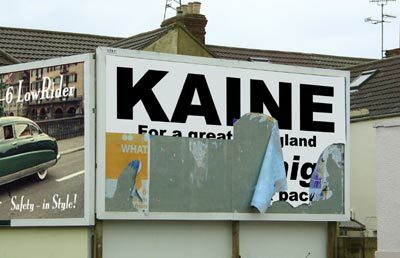 "KAINE For a greater England.Vote Whig and never look back." Shades of Citizen Kane, here, I feel. Incidentally, the whigs in their heyday were strongly opposed to slavery, religious intolerance and supported parlimentray reform. The whiggism that Kaine supports in TN2 was the consolidation of power within the landed gentry and those of high rank, a policy the whigs pursued until the reform act of 1867. Kaine's party promotes a country run by 'people that matter', as well as a whole host of other right-wing ideologies, such as British unification. 200 editions, hand printed B&W. 198 editions printed.